You’ve heard that you should carbo-load before participating in big athletic event — but that doesn’t mean you should tuck into a plate of spaghetti or a bagel before every workout. Making smart meal choices before exercising ensures you have the energy to power through even the most challenging of workouts. Eating well is an important factor in maintaining muscle mass and efficiently reaching your weight loss goals. You might have heard that working out on an empty stomach helps you burn fat, but it also causes your body to burn through protein stores in your muscle instead of your kidneys and liver. In turn, this leads to a slower metabolism, and you’re right back where you started. Ƒood is fuel, and if you struggle to work up the energy to leave your house and hit the gym–or keep up your stamina once you get there–try powering up with one of these foods before your next workout. To take your fitness plan to the next level, consider making an appointment for an in-depth consultation with a registered nutritionist and exercise kinesiologist at Elitra Health. Our experts can lead you through a complete body composition analysis and food diary review to develop a personalized nutrition and fitness plan. You’ll leave the Elitra’s Manhattan Longevity Center with a complete breakdown of meal and snack solutions to help you change your lifestyle and body at the same time. The King Kong of pre-workout combos, there are multiple reasons to reach for a banana and a spoon of peanut butter for a quick power snack. The banana provides simple carbs for energy and potassium to increase your muscle function, as well as vitamin B6 to boost energy. Research has shown that eating a banana is as effective as drinking carbohydrate-rich sports drinks for maintaining endurance during intense physical activity. 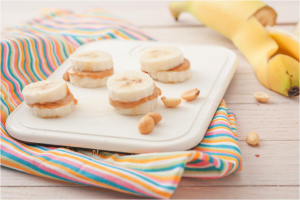 The fiber in the banana also helps decrease hunger, while the niacin in peanut butter helps your body harvest energy from the carbs. The peanut butter also contains monounsaturated fats to keep you full while also stabilizing your blood sugar. Just make sure to follow the serving size when dolling out your peanut butter, or you’ll have far more calories to work off on the treadmill. If you despise bananas, you can achieve much of the same effect with the natural sugars, carbs, and fiber of a medium-sized apple. 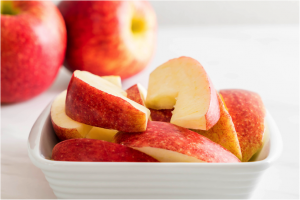 Combined with the fruit’s high antioxidants levels, an apple provides a slow release of energy to keep you full and alert. For protein, you can pair your apple with peanut butter or go for a more savory snack of a semi-hard cheese. 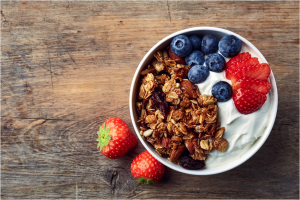 Eating Greek yogurt has been linked to weight loss in medical studies, and one cup can have two to three times the amount of protein as an egg. The whey and casein in the yogurt gives you a double shot of both fast and slow-digesting proteins that prevent muscle breakdown. Add in berries and granola on top, and they’ll give an energy boost via their easily digestible carbs. 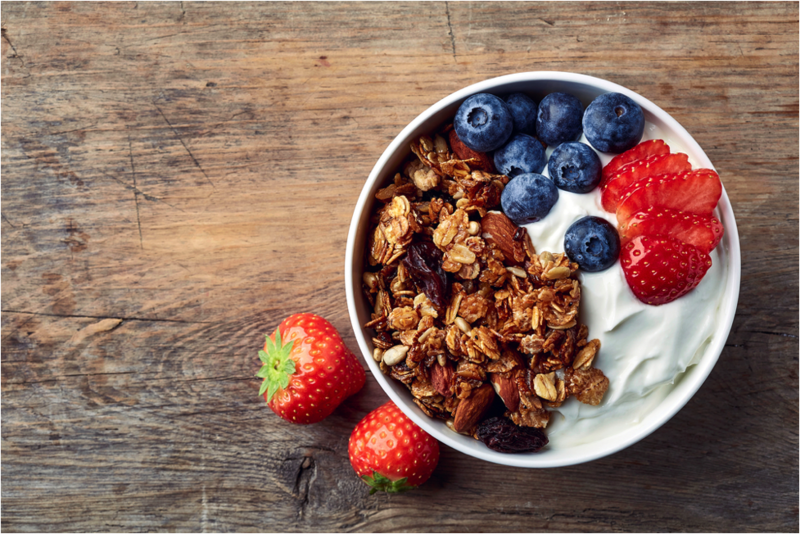 Look for plain Greek yogurt and granola that’s low in sugar by opting for mixes with chia seeds and oats made using coconut sweeteners (and, sorry, no chocolate bits). You can swap in the Greek yogurt for cottage cheese and mix in a half-scoop of protein powder if you’ve committed to a protein diet. A diet staple among bodybuilders, a large sweet potato contains close to 40 grams of complex carbohydrates that provide some serious fuel. A sweet potato contains natural sugars that will give you an energy boost without any crash, as well as a high fiber count to stabilize your blood glucose levels. 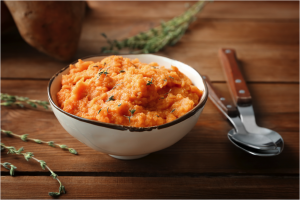 A cup of sweet potato has roughly the same amount of potassium as a medium banana in addition to other electrolytes, such as sodium and magnesium that help your body break down nutrients to produce energy. Keep it healthy by sticking to baking or steaming your serving of sweet potato and going for a low-calorie topping, such as a spoonful of Greek yogurt or a drizzle of hot sauce. Throwing a granola bar in your gym bag before you head out the door gives you an easy, no-mess power boost—if you shop wisely. 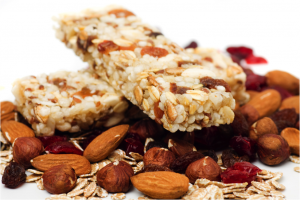 Granola bars are sometimes a wolf in sheep’s clothing and can be packed with chocolate and high-sugar bases masquerading as health food. Look for a bar made from hearty oats full of complex carbs and dried fruit for a concentrated source of simple carbohydrates. Or, save yourself the calories and price tag by making a batch at home. 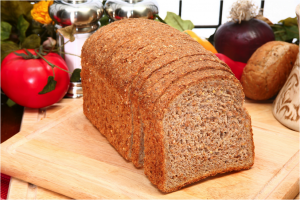 Sprouted grain Ezekiel bread is one of the most popular carb options among bodybuilders, as it contains high fiber, complex carbs and no added sugars. Top it with peanut butter or a hard-boiled egg for protein and leucine, an amino acid that stimulate energy production by allowing the cells to take in more blood sugar. Leucine helps increase the breakdown of fat to help you to slim down after fueling up. We get it: Sometimes yogurt and fruit combos don’t hit the spot. Grab a bag of brown rice you can steam in the microwave before a workout if you want something to warm you up and give you a dose of fiber, vitamins and minerals. 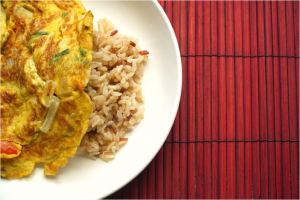 A cup of brown rice packs 3.5 grams of fiber, which helps regulate your blood sugar to keep you chugging along. If you want a more complex grain, you can swap the rice for a cup of quinoa. The superfood gives you 39 grams of carbs, 5 grams of fiber, and 8 grams of protein, plus over 20 percent of your daily recommended intake of manganese and magnesium. Scramble an egg and top it with some hot sauce, and you have a pre-gym snack that’s as warming as it is filling. Oatmeal is high in a fiber known as beta-glucan. It sticks to the side of your stomach to slow the absorption of glucose to release energy over time and prevent that “empty” feeling without making you bloated. 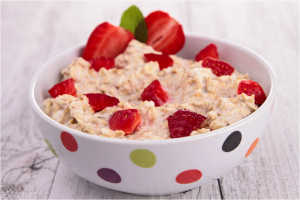 You can make overnight oats for an easy breakfast and cut up a few fresh strawberries in the morning to throw on top. Strawberries contain 7 grams of natural sugar per cup to keep you energized and help you load up on antioxidants and your full recommended daily intake of Vitamin C.